Shred chicken, dice onions, chop tomatoes or puree baby food with the Cuisinart Custom 14 Cup Food Processor. The new standard in food processing appliances, the Cuisinart Custom is an excellent product for in home food prep. The 14 cup work bowl features a steel shredding disc, 4 mm slicing disc, and chopping blade - all of the accessories need to create salsa, pesto and more. A powerful 720 watt motor gets the job done without hesitation, maximizing the capability compared to traditional food processors. Included with the Custom 14 Cup Food Processor by Cuisinart is a spatula and large pusher to assist in emulsifying all of your ingredients for vinaigrettes or press each ingredient thoroughly into the processor to evenly grind, chop, and shred. Disassembled parts are dishwasher safe, making clean up simple and hassle free! Expand your culinary skills in the comfort of your home with the Cuisinart Custom 14 Cup Food Processor in White! 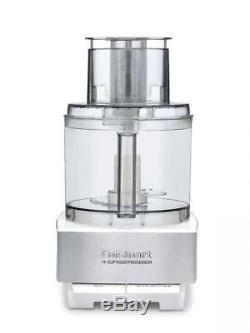 Cuisinart Custom 14 Cup Food Processor - White Features. 720 watt power system with strong and durable motor. 14 cup work bowl with comfortable grip handle. Extra large feeding tubes for bigger food items. Small and large pushers included to process evenly. Included steel shredding disc, 4 mm slicing disc, chopping blade. Spatula and instruction/recipe booklet included. Parts are dishwasher safe for easy cleaning. On - Off - Pulse buttons included. The item "Cuisinart Custom 14 Cup Food Processor White" is in sale since Tuesday, July 31, 2018. This item is in the category "Home & Garden\Kitchen, Dining & Bar\Small Kitchen Appliances\Food Processors". The seller is "frisco_trading_company" and is located in Springfield, Missouri. This item can be shipped to United States, Canada, United Kingdom, China, Mexico, Germany, Japan, Brazil, France, Australia, Denmark, Romania, Slovakia, Bulgaria, Czech republic, Finland, Hungary, Latvia, Lithuania, Malta, Estonia, Greece, Portugal, Cyprus, Slovenia, Sweden, South Korea, Indonesia, Taiwan, South africa, Thailand, Belgium, Hong Kong, Ireland, Netherlands, Poland, Spain, Italy, Austria, Bahamas, Israel, New Zealand, Philippines, Singapore, Switzerland, Norway, Saudi arabia, Ukraine, United arab emirates, Qatar, Kuwait, Bahrain, Croatia, Malaysia, Chile, Colombia, Costa rica, Panama, Trinidad and tobago, Guatemala, Honduras, Jamaica, Viet nam, Uruguay, Antigua and barbuda, Belize, Dominica, Grenada, Saint lucia, Turks and caicos islands, Barbados, Bermuda, Brunei darussalam, Bolivia, Ecuador, Egypt, Iceland, Jordan, Cambodia, Cayman islands, Sri lanka, Maldives, Oman, Peru, Pakistan, Paraguay.